The fourth race of the Thunderslot 2018 Race Series was held on May 19. As i was unable to attend, Alejandro was kind enough to write the story and take photos. Many thanks to Alejandro. Check out the revised overall results at the end of the article! with Shawn again in the top with 78 laps!! laps Steve was 73 laps Shawn ended with 234 laps! John came back to the race on the sixth heat to make 70 laps. Steve with 76 (one short of Alex ??? unintentional contact ????) to finish with 224 laps. 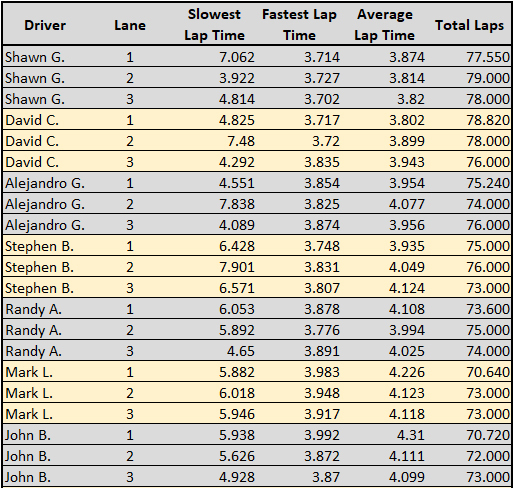 David with 232.82 only 1.73 laps behind ( a blink of the eye ) Alex made a third-place Steve fourth. ( he missed the royal wedding only to race with us ). This car is very impressive, fast and stable. This race proves that a lot can be achieved with good setting and practice. More to see? don’t miss the next race !! !